Coppicing was widespread across Europe for many centuries, but during the last 150 years, it has been largely abandoned. Most of the former coppices have been converted to high forest, especially in Central and northwestern Europe. Recently, there has been renewed interest in restoring coppices in some regions, primarily for biomass production and nature conservation. However, there is limited information on the sprouting ability of European tree species, which is the key prerequisite for successful coppice restoration. To address this gap, we evaluated the post-harvest stump sprouting of the three main species of Central European coppices—sessile oak (Quercus petraea (Mattuschka) Liebl. ), European hornbeam (Carpinus betulus L.) and small-leaved lime (Tilia cordata Mill. )—in relation to the stump diameter and density of residual trees. Lime and hornbeam resprouted from stumps of all diameters, but sprouting ability declined with increasing stump diameter in sessile oak. Lime produced greater numbers of sprouts with greater diameters and heights than either oak or hornbeam. The number of sprouts per stump increased with stump diameter in all three species as did the height of lime and hornbeam sprouts, whereas there was no such effect on the height of oak sprouts. The sprouting of hornbeam and oak increased and decreased, respectively, with an increasing density of residual trees. In conclusion, our study shows that all of the studied species are able to resprout even at an old age and after a long period of neglect; however, there were important differences among the species. The results also indicate that the age of the parent trees at the time of cutting may significantly affect the tree species composition of a newly restored coppice. We thank Michal Kuchta and Martin Juhn for their collaboration on this study. Also, we are thankful to two anonymous reviewers for valuable comments on a previous version of this manuscript. This study was funded by a research grant from the Ministry of the Environment of the Czech Republic SP/2d4/59/07 for the project “Biodiversity and target management of endangered and protected organisms in coppices and coppice-with-standards under system of Natura 2000” (TARMAG 2000), by the project NAZV ČR No. 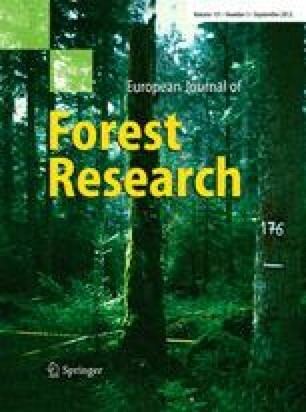 QH71161: “Coppice and Coppice-with-standards—Adequate Forest Management Alternative for Small and Middle Forest Owners”, by an IGA project of the Faculty of Forestry and Wood Technology of Mendel University in Brno titled “Use of genetic information in forest botany, tree physiology, dendrology and geobiocoenology” and by the Institutional Research Plan MSM 6215648902/04/01/01 of the Faculty of Forestry and Wood Technology MENDELU Brno.